BOLD: it's a game of risk and reward. Will your memory let you down or make you the winner? After you find one or more matches, will you keep your points and pass or increase your risk (and possible reward) by turning over another card? Let's see how bold you are! Are you a risk taker? How well do you trust your memory? Do you believe in luck? Introducing a fun new matching game that tests how bold you really are. With the new BOLD card game, you're trying to match cards that show three kinds of containers that vary in color, size, and pattern. Can you remember where the matches are? And will you be willing to put your points where you memory is? Shuffle the cards, and then place them face down in a grid formation. This game is great for game lovers age 7 and up; the youngest player goes first and turns over two cards. Do the containers you've unearthed match in type, color, size, or pattern? If yes-that's a pair! Now comes a test of your mettle: will you take your points and run or will you gamble them by flipping another card hoping it will share a feature with the first two? The game becomes more intense as it goes on and you remember more! To win the BOLD card game you need memory, nerve, and maybe a little luck. 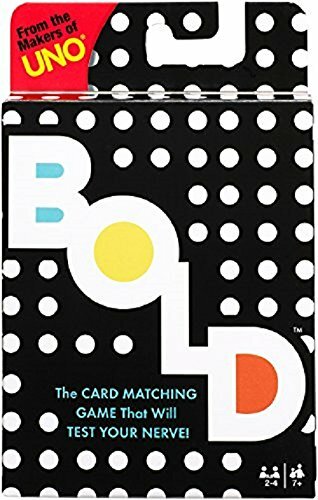 Simple to take and play anywhere, BOLD consists of 85 cards and instructions. Fun for 2-4 players of just about any age!